Families across California approved for at-home nursing care are struggling to get the help their kids desperately need. 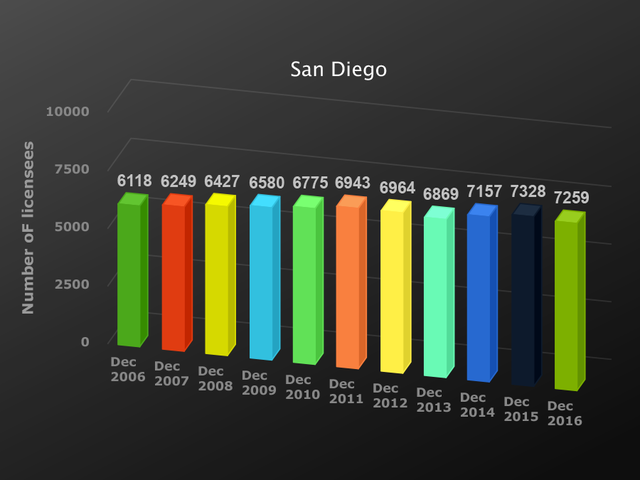 SAN DIEGO — Families across California approved for at-home nursing care are struggling to get the help their children desperately need. Experts tell Team 10, they're struggling to recruit and retain nurses willing to work for less than what they can make in the private sector. "This is not keeping pace with inflation right now," said Alisa Beaubien. Beaubien is struggling to get nursing care for one of those children, her four-year-old son Julian. "I would like Jerry Brown to pass a bill to raise Medi-Cal rates or raise the Medi-Cal pay for these home health nurses," Beaubien told Team 10. Julian was born a happy, healthy child, but then at 2 months old, Julian came down with a virus, she said. Beaubien said she took him to the emergency room and he stayed in the hospital for six months. "The condition he has is very rare... it's an axonal neuropathy," she said. Beaubien said Julian can't walk or sit up. He's fed through a gastronomy tube and breathes with the help a ventilator. "I love him and he is the most positive thing," she said. Beaubien and her husband have health insurance through the military. She said they are also Medi-Cal approved for home health nursing 22 hours a day, seven days a week. 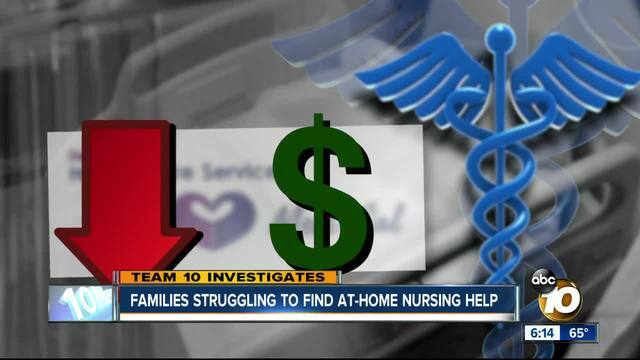 Home health advocates tell Team 10 there's a nursing shortage. One of the most the coveted nurses for at-home health is a licensed vocational nurse (LVN). According to the California Board of Vocational Nursing and Psychiatric Technicians (BNVPT), LVNs are entry-level healthcare providers who are responsible for rendering basic nursing care. A vocational nurse practices under the direction of a physician or registered nurse. The BNVPT said 99,834 people in the state currently have a valid LVN license. Health advocates and multiple home health agencies tell Team 10 the shortage is partly due to what they believe are out-of-date Medi-Cal reimbursement rates. They said it makes it difficult to recruit nurses with the right skills. Experts tell Team 10 after the cost of doing business, nurses are only making about $18 to $20 an hour. They say if nurses took their skills somewhere else, they could be making two to three times that. "It hasn't kept pace with the cost of living," said Assemblymember Brian Maienschien. "It hasn't kept pace with frankly supply and demand." Maienschien is Julian's state assemblymember. Team 10 asked Maienschien if the state is doing enough to help these families. "I don't think so," Maienschien said. "I think there's more that can be done." While Julian is already at home, Maienschien tells Team 10 many kids are receiving care in hospital intensive care units because they can't get the at home help. Maienschien is proposing a bill that would in part increase Medi-Cal reimbursement rates. "As a result of increasing the reimbursement rates it takes these kids out of a much more costly system, into a system in terms of the overall result will be less costly," he said. "Gives them better care and gives a better quality of life as well." Sen. Toni Atkins issued the following response: "Medi-Cal is a critical source of healthcare for millions of lower-income Californians, but it's not without challenges. Reimbursement rates for providers, including LVNs, are critical to maintain the access to care that people need. I have supported legislative efforts, and a tax on tobacco on last year's ballot, to bring more money to the program and will continue to make it a priority this year." The state Department of Health Care Services tells Team 10 that "roughly 3,900 Medi-Cal beneficiaries under age 21 received Early and Periodic Screening, Diagnosis & Treatment (EPSDT) private duty nursing in fiscal year 2014-15." "The Department of Health Care Services is evaluating some of the care delivery and services provided to better assist Californians who rely on Medi-Cal. There has been some anecdotal evidence of a potential increase in demand for Home Health Agency (HHA) services. To help meet demand, the Department is working on a process that will better assist families with locating the appropriate providers to fulfill the hours that have been authorized for their HHA services. The level of payment for HHA services is just one of the components to consider when evaluating overall access to care. Other factors impact access to care, such as the geographic availability of providers and the competing market demand for such providers. It's important to note that any change to Medi-Cal reimbursement rates, including HHA services, are a part of the state budget process and must also receive approval from the Centers for Medicare & Medicaid Services." The Department tells Team 10 they have developed a monitoring plan in response to the Centers for Medicare and Medicaid Services new requirements for states’ document of access to care and service payment rates. They are also working on a tool that will allow families to let them know if they are having trouble with home health agencies fulfilling all of their requested hours.